Historical inflection points only appear in historical rear-view mirrors, so while you might think you're currently living through the most boring year on record, you really never know, do you? 1979 certainly seemed like a nadir at the time, especially in the United States. I remember the term "malaise" being thrown around, and recall that the chances of then-President Carter being elected for a second term being about nil. (Note: he wasn't). The US may have been a glum global actor at the time, but was still an international prime mover, in the throes of the Cold War and learning to deal with international shame and humiliation vis-a-vis the taking of American hostages by Iranian students. Elsewhere, important inflections were proliferating in 1979 that profoundly impact the world we live in today – sometimes almost by chance, as it turns out. Christian Caryl's admirable book does some strong historical reconstruction that helps us to see this pivotal year in context by grabbing hold and wrestling to the ground five key storylines. First is the aforementioned rise of what we now call Islamic fundamentalism in Iran. After decades of kleptocrats and dictatorial quasi-democracies, the middle eastern religious world of Islamic belief was beaten down and left for permanently battered, while religion itself was still a driving force in middle eastern families and communities. Most pundits and observers of global events had little inkling of the holy groundswell that was taking place in Iran (and to a lesser extent, in other Islamic countries like Egypt) in the mid-1970s. Caryl describes the rule of Mohammed Reza Pahlavi, the Shah of Iran, and how he and other 50s, 60s and 70s leaders in the Islamic world saw themselves as near-secular modernizers of Islam, in the vein of Turkey's Kemal Atatürk. This is an engrossing story, told over multiple brisk chapters, since we all know what happened in 1979 to turn that completely on its head: the return of Ayatollah Khomeini from exile in Paris, the people's revolution, the immense groundswell of suppressed, messianic Islamic religious fervor, and the storming of the US embassy and the taking of the American hostages as retaliation for years of propping up the Shah. The world is still living today with a radicalized, religious, theocratic Iran and all the challenges this presents to the West and to secular peoples within the Middle East. Similarly and somewhat in parallel, the Soviet invasion of Afghanistan awakened the self-determination and religious fervor of non-Communists and fundamentalists there, and the backlash to this blip on the Cold War radar helped to hasten not only the fall of the Soviet system but the rise of the Taliban, Osama Bin Laden and the islamic jihadi movement. Yes, it happened in 1979. 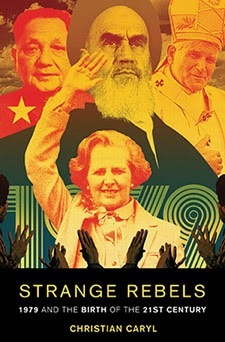 On the other side of the world, both literally and metaphorically, Margaret Thatcher was leading her own revolution in the UK, turning aside decades of liberal labor-pandering and sclerotic public services with a conservative, free-market ideology that had never truly been tested in actual governance before. 1979 was the year that Maggie truly consolidated her hold on power in England, and over the course of the next decade helped to remake that country while proving that there were viable alternatives to social democratic rule in Europe and elsewhere. The year also saw the selection of a Catholic pope from Poland, and in it a direct challenge to the Soviet Union's crushing vice-grip hold on Eastern Europe's hearts and minds. Pope John Paul II traveled in 1979 to his native country, and set up an abstract ideological power struggle between freedom and tyranny that resonated for millions around the world. The book has a great chapter about how the trip was almost blocked entirely by Moscow, and their lack of success in doing so said a great deal about just how much the USSR was swayed by public opinion and pressure from the west (to say nothing of loathing from people in its eastern bloc). Finally, when we take stock of our world in 2014 – a Communist-free, market-centric world, one that happens to be riven with tremendous upheaval in the Islamic world, there's one other huge transformation that started in 1979, and that's the modernization of China under Deng Xiaoping. I thought this would be my least favorite and the least convincing of the 5 stories, and as it turns out it was by far the most interesting, relevant and impactful upon the largest number of people. Caryl essentially tells the story of China from World War II through Mao's famines, the Cultural Revolution, the Gang of Four and Mao's death. The huge vacuum that was filled upon his passing was filled by Deng, a small, unassuming man who nonetheless had some pretty radical ideas about how to merge Chinese Communism with western capitalism. The wholesale transformation of China's south, and later the entire country, began on his watch and due to his initiative. It lifted millions out of poverty and what was effectively indentured servitude, and gave rise to the fastest path to broad societal wealth ever seen in any nation. He may have still been a brutal, people-suppressing Commie thug on many levels, but his impact on his people's and the world's well-being was enormous. In my country, Jimmy Carter bided his time before he was booted out of office, encouraged us to turn the heat down and wear sweaters, and we watched disco die its final horrible and deserved death. Nice to have a mellow year while much of the rest of the planet was knocking the trajectory of history off its axis.